The Low Profile vehicle scale system is complete and includes the Cyber 500 Indicator and Printer. Comes in steel or concrete platform. Platforms are shipped 11′ wide and require an “over wide” permit. VE 52 Series Heavy Duty (Optional) Truck Scale – H.D. 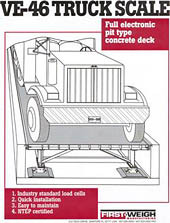 3/8″ thick checkered steel deck sustains axle loads of 100,000 lbs. Warranty for 50 tandem axle loads. Designed for applications requiring heavy duty designs for heavy axle loads. Ideal for coal, rock, steel, and lumber industries. Platforms are shipped 11′ wide and require an “over wide” permit. The First-Weigh “PC” (portable contractor) option now allows for a fully electronic truck scale to be shipped complete with load cells, load cell stands, and bumper assemblies. Designed for fast installation on any firm, flat surface. No concrete foundation is required. Install on a bed of gravel, railroad ties, or on any well-drained area. Footings are not required. Each scale is modular with a full under-frame and steel construction. A fully electronic Pit Type Concrete Deck, for applications when only a pit scale will do. Certification includes up to 14 feet to meet the needs of the fertilizer industry and other industries using extra wide vehicles. NTEP Certified. Installation is quick and easy with dramatic savings. Easy to maintain. The Scale System’s data collection System is an Event or Menu Driven, User Friendly, Database Management System. The Scale System Software packages are customized to meet the end user needs. Landfill, Recycling, Manufacturing, Inventory, Transfer, Sand and Gravel, Scrap, Grain, Refinery, Food, Textile. Custom Packages available. For help in selecting the Truck Scale System best suited for your application, please contact us.